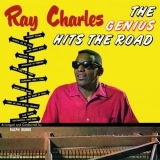 Anthology (compilation) (1988), The Definitive Ray Charles (compilation) (2001), A 25th Anniversary In Show Business Salute To Ray Charles (1971), The Genius Hits The Road (this album) (1960), Greatest Hits (compilation) (1962), The Very Best Of Ray Charles (compilation) (2000), The Distinctive Ray Charles (compilation) (2006), Ray (Original Motion Picture Soundtrack) (2004), A Man And His Soul (compilation) (1967), The Ultimate Collection (compilation) (2014). Related links: top tracks by Ray Charlestop tracks of the 1960s, top tracks of 1960. One of Ray's greatest recordings. A beautiful, soulful song, perfectly sung. Timeless.